Convoy organiser hopes owner-drivers make their opinions known to the Road Safety Remuneration Tribunal. Rodney Chant hopes the Road Safety Remuneration Tribunal will rethink minimum rates if enough owner-drivers make their thoughts known. One of the organisers of a convoy protesting minimum rates for owner-drivers hopes the event will spur people in the industry to have their say on the issue. Owner-driver Rodney Chant parked his truck on March 20 to act as MC for the Anti RSRT Freight Rate Convoy held at Berrinba, south of Brisbane. 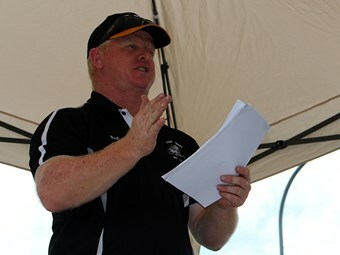 The Queensland-based Chant, who runs a refrigerated B-double interstate, welcomed the turnout given the event was organised on short notice. But he quickly added more work needed to be done. "I’m very happy with the turnout. We had no idea how many people were actually going to be here," Chant says. "I’m happy with the passion, but the passion has to be put into action. We have to get submissions. If we can get submissions from nearly everybody that is here we are laughing." The submissions Chant is referring to are those the RSRT last week asked for to determine if it should vary the April 4 start date for minimum rates. The tribunal is considering delaying the scheme until January 1, 2017 and phasing the rates in over a 36-month period. The cut-off for the submissions is today, and hearings are due to be held over the Easter period. Chant believes if enough owner-drivers step up and have their say then the tribunal may rethink its plans. "I think it will play a big part in delaying the start of it so people can restructure or at least get their head around where they stand," Chant says. He says he has serious concerns for owner-drivers and their families if the tribunal presses ahead with its current plan to implement mandatory minimum rates on April 4. "My first and foremost concern is the health and wellbeing of families. Secondly, the financial wellbeing of families, the people who have worked hard to get to where they are within the industry," he says. Chant believes the RSRT’s rates scheme will price owner-drivers out of the market for work and that the tribunal should be targeting the whole trucking industry if it wants to introduce minimum rates. He says not enough information has been provided to owner-drivers. Indeed, when he asked the crowd assembled for the convoy if they had only heard about the RSRT’s plan in the last few weeks, almost everyone raised their hands. This is despite the RSRT announcing the plan in December last year. The RSRT will hold a mention on March 24 to decide if hearings need to be held from March 26 to 28 on varying the implementation of minimum rates.